Sermona, Martes First In MILO-Urdaneta | JustRunLah! URDANETA CITY – Former champions Julius Sermona and Cristabel Martes showed that they can still match strides with the new generation of runners by ruling the inaugural regional qualifying race of the 41st National MILO Marathon Sunday morning (July 16). They will also lead the first batch of qualifiers for the National Finals set for December 3 in Cebu City. 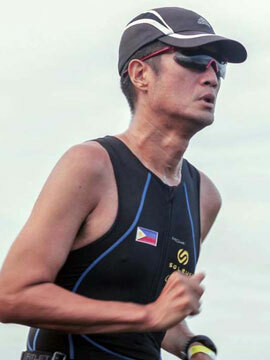 Sermona, the MILO King way back in 2006 and a soldier in the Philippine Air Force, clocked 1:15:31 in the 21-kilometer race that started at the old City before proceeding to a round trip along the MacArthur Highway and finally ending at the Urdaneta Cultural and Sports Center. He was followed by Hernani Sore (1:17:21) and Romulo Balinas Jr. (1:20:45). Martes showed the strength and form that gave her four MILO Queen titles with a time of 1:23:45, almost 24 minutes ahead of runner-up Rowena Valdez (1:47:12) and 31 minutes over third placer Isabel Milagros Quipsie (1:54:10). So dominating was Martes that she placed fifth overall with only four males faster than her in the field that attracted 12,000 runners. In last year’s Nationals hosted by Iloilo City, Martes finished in second place to Mary Joy Tabal thus allowing her to match the former’s record of four titles. Sermona landed in third place behind eventual champion Jeson Agravante. The next regional qualifier will be hosted by Laoag City a week from now on July 23. What follows is the highly anticipated Metro Manila qualifier to be held at the SM Mall of Asia in Pasay City on July 30.